We got up at the crack of dawn this morning (well 7am) to wait in line for Midnight Madness tickets tonight. We thought we would be near the front of the line but to our surprise there were at least 145 people ahead of us. (Do you see the big long line behind me?) The first guy got here @ 5am! Yikes! He must really wants to go to Midnight Madness! He's not going to sleep until well after midnight tonight. The event really starts @10pm and lasts until midnight. Years ago it used to start @ midnight and ends @ 2am. It was just too hard on the instructors (and students) to wake up next morning for the early session. I always have a ton of fun @ Midnight Madness. Their motto is to learn absolutely nothing about Photoshop. I can't really go into too much details it would spoil the fun for you. 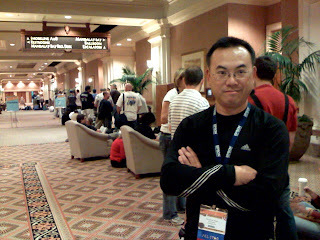 (What happens in Midnight Madness stays in Midnight Madness) if you want to experience this unique event, you'll just have to come to Photoshop World and wait in line patiently at the "crack of dawn" like we did. P.S. I'll post more details about Midnight Madness tomorrow. I just don't want to spoil the fun for some of you just in case you're reading this entry.